The SDI to AV scaler converter allows SD-SDI, HD-SDI and 3G-SDI signals to be shown on CRT or HDTV while ensuring high bit rates of 2.970 Gbit/s to give you fast signal transmission without any loss. The SDI to AV scaler converter allows SD-SDI, HD-SDI and 3G-SDI signals to be shown on CRT or HDTV while ensuring high bit rates of 2.970 Gbit/s to give you fast signal transmission without any loss. For professionals this means that it is now easier to distribute and extend your 3G SDI signal while giving you the ability to display your work on TV thanks to the built in this converter. 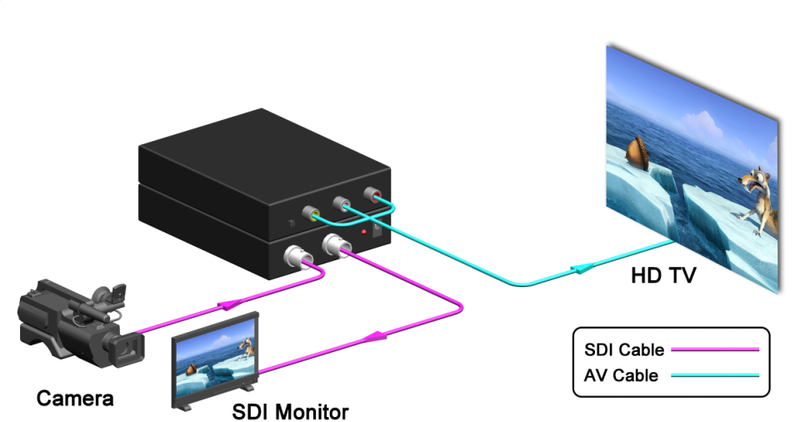 Furthermore, thanks to the loop-through 3G-SDI design, users are able to enjoy both SDI and AV at the same time. SDI-IN: This slot is where you connect the SDI source output for SDI signal sending to be display on screen. SDI-OUT: This slot is where you connect the SDI display with SDI cable for input source display. LINK: This green LED will illuminate when the device is connected with SDI signal. POWER : This red LED will illuminate when the device is connected with power supply. PAL/NTSC: Press this button to select PAL or NTSC. DC-5V: Plug the 5V DC power supply into the unit and connect the adaptor to AC wall outlet. CVBS L R: This slot is where you connect the TV with RCA cable.